My third Kate Morton book and it continued her high standard of story telling. All her characters are three dimensional, including the minor ones. Everyone has a story that makes them real and allows them to complete their role in the overall story. I loved the individual stories of Eleanor, Alice and Sadie and the similarities of the stories of lost children which created empathy within Sadie for both her current case and her cold case. 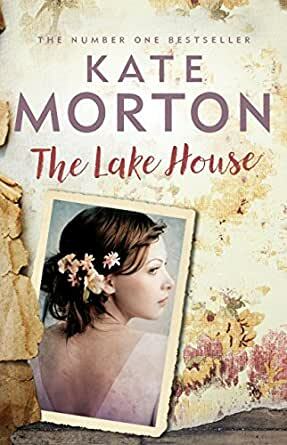 The ending for both was inevitable but Kate Morton leaves a sprinkling of clues through the various threads of the differing storylines to lead to a heart-warming conclusion (with a few happy tears shed by this reader). I ordered "The Lake House" in advance after reading "The Secret Garden" and I finished it in three days. I couldn't put it down. It's the story of police officer Sparrow who investigates a mystery of a missing toddler seventy years previously. All the characters in the book have different versions of what happened. There are lots of twists and turns in the story and the reader is never bored and the loose ends come together very satisfyingly at the end. I loved this book to start with and I hated this book by the end and therefore I found this such a difficult Novel to rate and review. Jumps back and forth between multiple time periods and characters with long-winded descriptions about everything and everyone. There's nothing strictly wrong with the story, I just found it dragging at points which seemed at odds with how compelling and cleverly the plot was, with cliff hangers galore, and I admit I wouldn't have wanted to give up without knowing how it all ended. . I was totally drawn in by the descriptive and vivid writing and the wonderful images that the author created. The characters in this novel are very well developed and likable, I loved the 1930s setting, the period house, set in an enchanted forest, a dysfunctional family with secrets and a mysteries going back 70 years. Perhaps I'm too impatient and the timing for this one was not right. Reading can be such a subjective endeavor sometimes. 2.0 out of 5 starsCould be better and less predictable! This is the first Kate Morton book I have read. I have read many detective and mystery books, including those by PD James and Ruth Rendell. I won't go into the details of the plot in 'The Lake House', as other reviewers have done so. I felt Morton's long descriptive narratives were precisely that and I often wished she would hurry up and get on with the story. It could have done with a strong edit, but then the book would probably be half the size. Her descriptions, although vivid, left nothing to the imagination, and her plot was totally predictable, unlike crime writers James and Rendell, whom she purports to have read. I could see what was going to happen before mid-way, and how it would end. The best characterisation was of DC Sadie Sparrow, but even in the chapters about her investigation, descriptions were far too long, and although some people might like that, I'm not partial to them. Consequently, I found much of it boring and found it very similar to other books I have read where Cornish (or British) country homes are linked with family mysteries. Nothing new. I could not put it down! A family secret around the disappearance of a small boy is the basis of this excellent book. There are overtones of the Parisian apartment locked for 60plus years (See Ella Carey's book Paris Time Capsule). I loved the way several generations were linked in the impact of the child's disappearance. How can any family cope with the question of a lost child? 5.0 out of 5 starsAnother Wonderful Read from Kate! I absolutely loved this book! It is certainly written in Kate's signature style & subject matter, quite wordy, numerous characters, multiple storylines & time frames & plenty of loose ends to keep you turning the pages! Best suited for those who like a more intellectual, lengthy read & it does require a bit of concentration to keep all the threads clear. I have read all of Kate's books & would certainly rank this one towards the top! I found this book intriguing and quite compelling in its subject matter and setting. How can a child just disappear into thin air and never be found, we ask ourselves constantly. Yet, the answer does compute at last. Mental health, love, war, nature, revenge and adoption all confront the reader. It lingers in our thoughts for many an hour after its conclusion. A lovely book. Loved the ending. Kate has an amazing way with words and is somehow able to paint a picture in her books of her intriguing complex stories and characters. She has an incredible talent and I love all her books. The Lake House gripped me right from the start and I was unable to put it down. So many interesting characters, relationships and possibilities. Such an enjoyable read.